Jenn Edge is a proven innovator and technical leader with over 12 years of experience in agile enterprise software development. 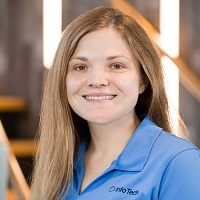 As an Assistant Director of Development at Info Tech in Gainesville, Florida, she manages teams building applications used in state highway and transportation agencies across the United States. She works across teams to continuously improve processes and quality. She coaches team leads based on her experience as a developer on a large web application, including 4 years as a lead developer. Jenn is an AWS Certified Cloud Practitioner and holds a BS in Computer Engineering from the University of Florida. 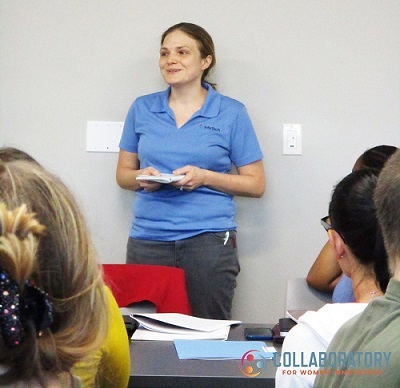 Jenn is involved in community outreach including speaking at conferences, mentoring other women in tech, and speaking with students about careers in software development. In 2019, she co-founded We Advance Tech Together (WATT) with Usha Suryadevara, Elise Carmichael, Priya Rudradas, and Sue Rocher. WATT is an initiative to support women in tech through community-building and mentoring. Jenn has been interested in programming since a teacher first introduced her to LOGO Writer in elementary school. As a teen, she learned how to build web pages hosted on GeoCities. She attended the University of Florida where she obtained a Bachelor of Science in Computer Engineering, learning about the layers of computational abstractions: from circuits and microprocessors to object-oriented programming and design patterns. In 2006, she joined Info Tech, Inc. as a programmer on a development team for an enterprise web application. In the last 13 years, she has gained technical expertise and refined her leadership ability, rising through the ranks from Programmer through Lead Developer to Assistant Director. She was instrumental in designing and advocating for innovative solutions that improved efficiency for the web development and implementation teams. 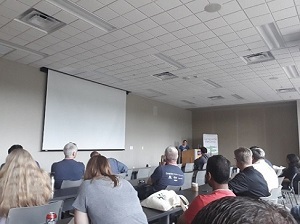 Jenn was a speaker at 2019 Orlando CodeCamp, Moms Can: Code Fall 2018 Virtual Summit, featured speaker at Gainesville BarCamp 2018, and speed mentor at the 2018 Grace Hopper Celebration. Co-presented session discussing statistics of women in technology and tech leadership. Announced our new organization, We Advance Tech Together (WATT), an initiative to support women in tech. Abstract: Development is failing over and over again at each step until you succeed, and learning how to do something just in time for everything to change. Continuous learning and growth is necessary to keep up with changes in technology and step into new roles in leadership. How can we automate self-improvement and make real progress on our goals? We’ll discuss the commonality between growth mindset and iterative development, feedback loops, and applying backlogs and minimum viable products to goal achievement. Attendees will learn about similarities between self-improvement and agile development and how to automate self-improvement through habits and environmental design using nudges from UX design. 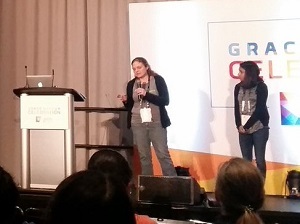 Shared my Grace Hopper Celebration conference experience with approximately 50 EWITS participants. Mentored attendees one-on-one in 6-minute sessions for 2.5 hours based on their interests and questions. Most conversations related to the transition from individual contributor to manager and how to effectively lead a team. Abstract: Development is failing over and over again at each step until you succeed, and learning how to do something just in time for everything to change. Continuous learning and growth is necessary to learn how to code, keep up with changes in technology, and step into new roles in leadership. Join me to look at the parallels between processes you may be learning or already familiar with in development and approaches to self-improvement proven to be successful in behavioral psychology. Attendees will learn how to improve goal focus with a sustainable pace and automate self-improvement using habits and environmental nudges. Volunteered at a local girls’ nonprofit to teach Microsoft Word for two 50-minute class periods, including giving a career-day presentation on software development. Internal company 1-hour workshop to introduce interns to our division, speak about continuous self-improvement, and create goals for their internships. Abstract: Do you want to make a lasting change, such as learning a new technology or becoming a better leader? Come learn how to develop a better you and nudge your dreams into reality. We’ll explore ways to achieve goals and form habits. Presented results for our Cloudera Team to all attendees at the end of a one-day hackathon. 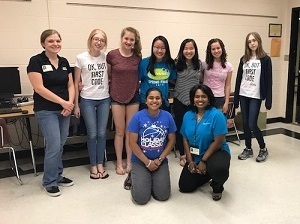 Spoke with local high school coding club (coderGirls) about careers in software development. Led many workshop and seminar-style training sessions for developer on-boarding covering subjects varying from team culture to project architecture and how-to workshops.